SALT LAKE CITY, Utah – HARMAN’s dbx today announced the goRack™ Portable Performance Processor is now shipping. The goRack is an easy to use loudspeaker management processor that enables a portable PA system to be optimized for the best-possible sound quality. The goRack incorporates the best of dbx’s acclaimed DriveRack series processing simplified down to its purest form, in a sleek and compact unit that fits into the palm of the hand. The goRack offers processing including EQ, compression, AFS Automatic Feedback Suppression, Subharmonic Synthesis for enhanced low-frequency response and more. Five buttons offer access to the most commonly used processing effects, and a large data wheel lets users quickly dial in any of the goRack’s processing sound-enhancement effects including 16 musical genre-based 31-band graphic EQ settings. The goRack’s compressor is based on the design of the original and highly acclaimed dbx 163X. The goRack also includes dual dbx mic preamps, selectable mic/line input settings, and AUX input and left and right channel volume controls. The dbx goRack connects between a mixer and an amplifier via its stereo inputs and outputs. 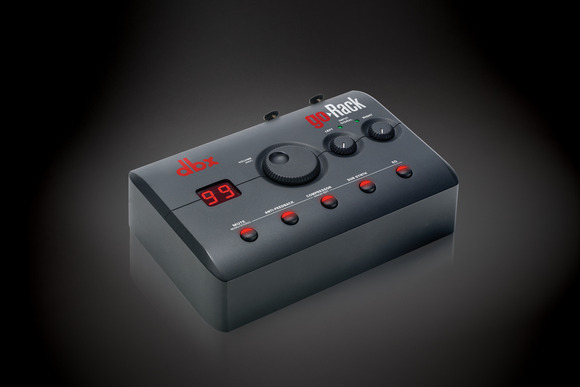 It offers combination XLR and 1/4-inch (Mic/Line) inputs and XLR outputs. It can also be used as a stand-alone performance processor/mixer for a solo artist. The dbx goRack Portable Performance Processor has a suggested street price of $99.95.